I am a wee bit tired, childrens. There are a bunch of major deadlines at work that have everyone cray-cray, which means it was a great time for me to quit seeing my therapist (I’m doing fine with it, although I’m still angry about the session spent on processing her financial needs, I figure I’d been considering moving on for some time, anyway). Mrs. Nator is the sickiest sick girl in the land, and her pathetic hacking and snorking has been keeping me awake for several nights (I am fortunate that we have the advantage - rare, in Brooklyn - of a large, cheap apartment, so I could switch to a far-away guest bed at 2 AM this morning). And the weather? Don’t even get me started. Deee-pressing (although it’s good for the plants and water table ‘round here, I know). All of which comes to: I’m probably not doing any major thought-provoking, meaningful posting for a little while. I actually had a number of interesting (I think) topics I wanted blather on recently, but, maybe later. Enjoy the little things. I recently happened upon Kiss My Face’s foaming hand soap in grapefruit & bergamot scent. It doesn’t soundlike much, but the smell of this stuff somehow activates all the happy energy chemicals in my limbic system. Also, it makes me crave Froot Loops (for which I settled for Barbara’s Fruity Punch Organic Wild Puffs, although they lack the same ring, both name and shape-wise). The point being, normally I am not the type to say “unhappy? Perk up your mornings with the delicious scent of Product X!”. This time, however, it’s true, so maybe you should check it out. Find humour where you can. Sometimes it has to be dark humour, but still. For example, you may have heard about the terrible flooding that is taking place in the northeast states, and how it is causing gajillions of dollars in damage and threatening lives. Yet? This: Is funny. 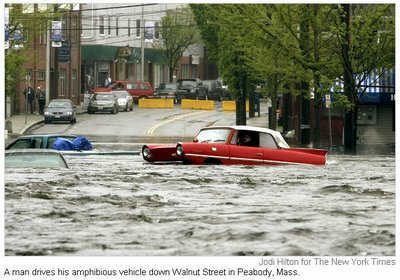 I mean, how long do you think that guy has kept his whacky amphibious car in the garage, just to one day have this opportunity to go “nyah nyah!” Hee. Plan something fun. Like, for example, your summer vacation – whooo! Although we’re not going to any exotic locations this year, Mrs. Nator, the financial half of the family, has authorized me a certain amount of funds and time to plan a week in Cape Cod. Although we won't go 'til July, just thinking about lounging on the beach, going on whale watches and the pirate museum has got me all excited, already. We have to be frugal, but it’s more than I expected we’d be doing (it turns out we most likely won’t be taking her family’s old car, after all, which means we don’t have to spend the time and funds to get it up here). So, when I get all aggravated at work, I can just think of this: And smile dreamily. Those are my deep thoughts for the day. Now go do something that makes you feel good.